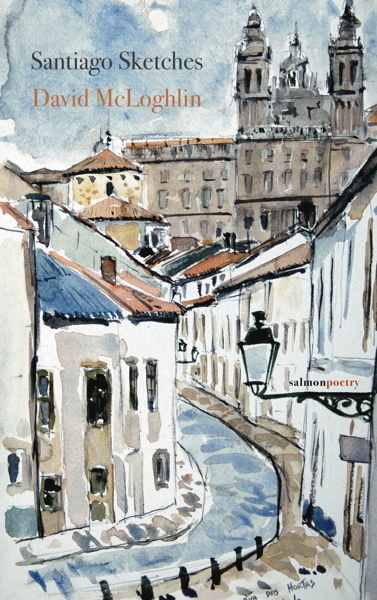 Santiago Sketches is a book of short, imagistic poems entirely set in Santiago de Compostela, where the small and the local are revealed to be universal, mirroring the process whereby this small city near Finis Terrae became central to human patrimony and declared a world heritage site by UNESCO. Since the 12th-century Codex Calixtinus—the first Camino de Santiago guidebook—many books have been written about the paths to Santiago. Santiago Sketches is one of the first books in English about living in that city to which millions have travelled, but which most arriving pilgrims depart after a brief stay. Here, McLoghlin uses his fluency in Spanish and galego, and his background as a Hispanist, to capture what Virginia Woolf called “moments of being”, and translate them to us. "Santiago Sketches has the immediacy of a diary kept on the go, and the colour, grace and formal definition of poetry. It’s full of youth, the readiness to explore, learn and play, and the life lived in public spaces that young people share with the “stumbling camp followers” of history. David McLoghlin writes of a church bell, “You can hear the real / rope pull in the ringing”, and his book too is real—like time and place, like near and far and long ago." "Santiago Sketches is brimming with sensory snapshots: whether “the richness of reused olive oil” issuing from cheap restaurants or a baker suggesting his customer crunch on the saint’s sugary bone or noting “high heels on marble [clicking past] confession boxes.” David McLoghlin reminds the reader of the marvelous reasons to be a tourist, that is, not to merely observe, but experience with all one’s senses. His poetry pulls us out of familiar routine and into a radiant one. By way of affecting detail and pensive tone, these poems are not mere souvenirs: join McLoghlin in his walk down avenues and alleys." Born in Dublin in 1972, David McLoghlin is the author of Waiting for Saint Brendan and Other Poems (Salmon Poetry, 2012), a section of which was awarded second prize in The Patrick Kavanagh Awards, and Sign Tongue, translations from the work of Chilean poet Enrique Winter, which won the 2014 Goodmorning Menagerie Chapbook-in-Translation prize. David received first-class honours from University College, Dublin for his research MA in modern Spanish literature. He also holds an MFA in Poetry from New York University, where he was a Teaching Fellow. 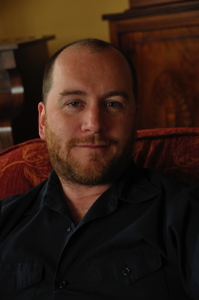 David received a major Bursary from The Arts Council / An Chomhairle Ealaíon in 2006, and was the Howard Nemerov Scholar at the 2011 Sewanee Writers’ Conference. Between 2003 and 2005 he received three grants to study Galician in Santiago de Compostela. Most recently, he was a prize-winning finalist for the 2015 Ballymaloe International Poetry Prize, judged by Billy Collins. His work has been broadcast on WNYC’s Radiolab, and published in journals such as Poetry Ireland Review, Barrow Street, The Stinging Fly, Cimarron Review, Hayden's Ferry Review and Poetry International. David lives with his wife in Brooklyn, NY. each other: small, gesticulating upwards. Old men frown, slapping down dominoes. You would see them on the steps of the Quintana when Spring had come and it was warm again: a tribe sprawled in the sun amongst the beggars and the gypsies. One day, from the rumble of harsh conversation, a hard laugh reached me. I looked over and saw him: wreathed in dope smoke, standing to stretch himself. His head was shaved except for the fallen yellow Indian crest, and on his chin was a faint stubble. In his boots, earrings and ripped shirt he stood like a tarnished king, wasted arms hanging limp with the suggestion of heroin. I watched him as he moved off—sparse, rangy—breathing him in. His eyes flickering over me as he takes me in: drift into my world.